Over the last two years, a team of volunteers have been using the University Archives to tell the stories of the staff and students from Newcastle University who fought and died in the First World War. Searching through class lists, course handbooks, registration documents, graduation lists and student magazines, they have slowly pieced together the lives of those who appeared simply as a list of names on our campus war memorials. These books and ledgers, with plain covers, and lists of information, perhaps wouldn’t normally appear in our Treasures of the Month feature. But the power of archive documents often lies in seemingly uninspiring lists. Those lists of names or numbers which can, once you start looking, shine a light on a moment in history, solve a mystery, start a new mystery, be really funny, or heartbreakingly sad. And from next week one of our student volunteers, Jake Wall, will be sending us guest blog posts about the stories he uncovers as part of his placement with us. But for now, this is just a little tribute to those books of lists! This is the place where all our volunteers start – the Roll of Service. This small and unassuming book lists all those who fought in the First World War, and marks the fallen with a black cross, together with brief military details. From this basic information our volunteers start to follow the leads and try to piece together the story of a fallen serviceman. 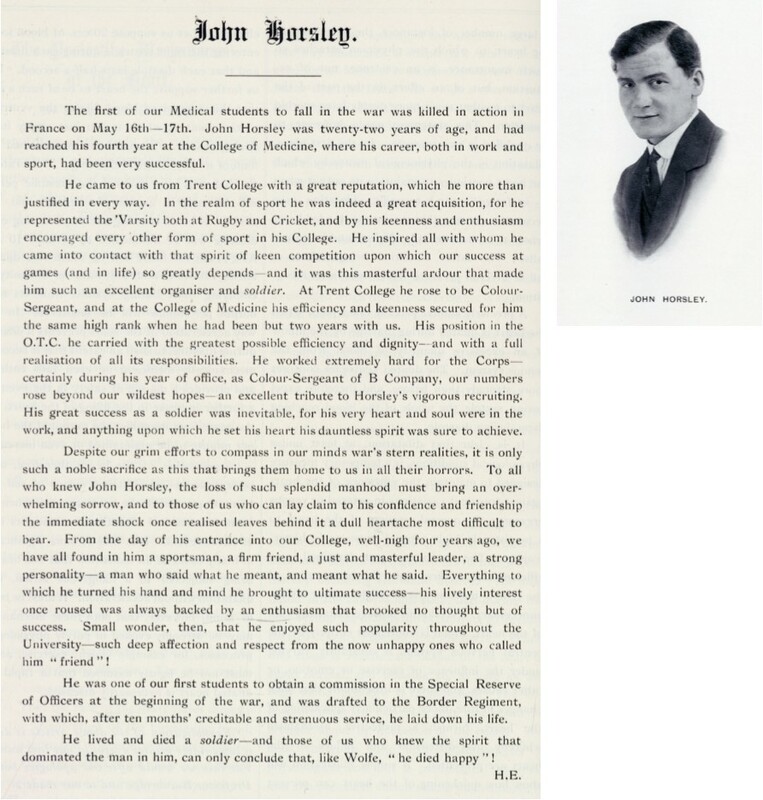 The Armstrong and Medical Calendars hold a wealth of information about a serviceman’s life whilst he was a student (or member of staff) at the University. Containing student lists, staff lists, course notes, teaching schedules, exam schedules, building maps, and so many other things, they were intended to hold everything a student would need to know for the year. Of course, for our volunteers, finding out exactly which years a serviceman studied with us is the hard bit. Much painstaking reading of class lists can sometimes be necessary until finally the name you are looking for magically appears. This list however shows one other impact of the war. 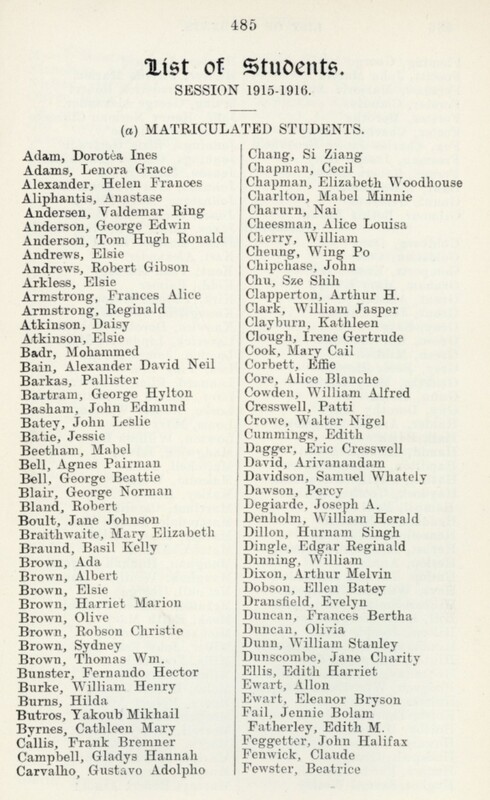 Although both Armstrong College and the Medical College already offered places to women before the war, the list here shows how high a proportion of places were taken by women once the War had started. Often the most heart breaking pieces of the story to read will be the serviceman’s obituary. These obituaries, published in the student journals of the time, were often written by fellow students who had known them during their time at the University. They are of course desperately sad, but the desire of these men’s fellow students to honour their memory is obvious, and we hope that one hundred years later we are continuing this work. This entry was posted in Treasure of the Month, unisatwar and tagged First World War, HLF, Newcastel upon Tyne, Newcastle University, Soldiers, Universities at War, University Archives, World War I, WWI by nspeccoll. Bookmark the permalink.